The root cause is likely an access rights issue. Giving Full Access to C:\ProgramData\DSI\NeuroScore is the preferred solution, but it may not be sufficient. If the above two solutions do not work, you may want to install NeuroScore outside of C:\Program Files\, because access rights are too restricted in this folder. For example install it in C:\NeuroScore\. Make sure that the access to this folder is not restricted. You may notice that NeuroScore will create a NeuroScore.zdb file in the program folder. This again shows that NeuroScore does not manage to write into the C:\ProgramData\DSI\NeuroScore. 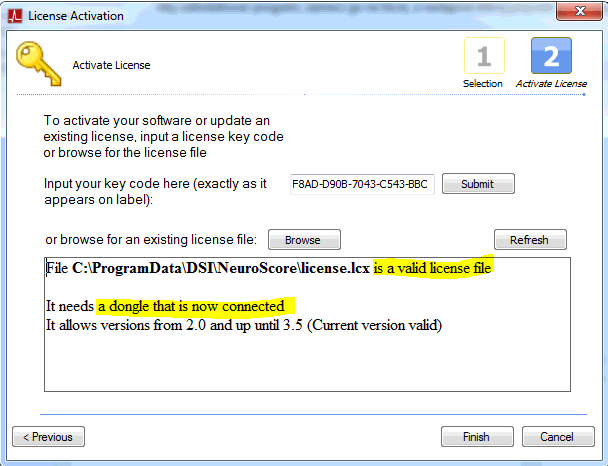 Manually copy the license.lcx file in the program folder, and make sure that NeuroScore starts without any error. Note that the file should be called exactly as displayed above (case sensitive).